Something you may not know about me is that I do, in fact, love floral printed fabric. I'm not sure what it is about my branding or the vibe that I put off, but I can count on 2 fingers the number of clients that have hired me and liked floral prints. 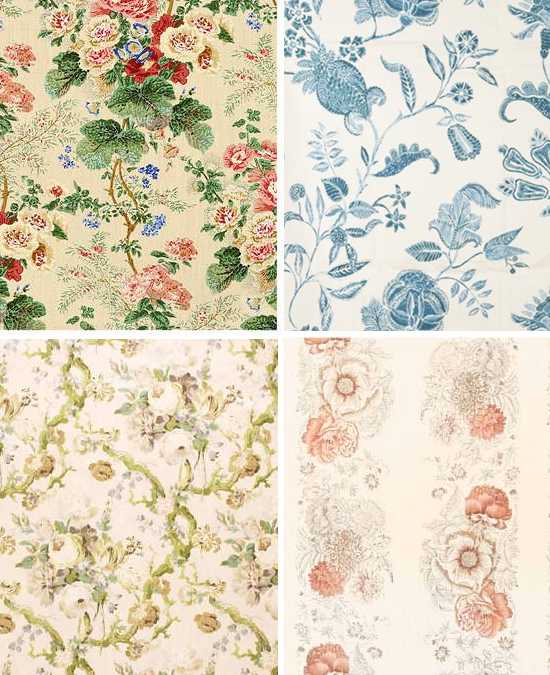 Many of my clients will go for leaves or something with the essence of nature or even stylized or abstract floral patterns, but when it comes to traditional floral prints; the ones that look like Martha Stewart's garden in pillow form, it doesn't interest them. I know that my designs are much more contemporary than traditional, but what I enjoy most is a contemporary take on traditional elements. That sounds oh so cliche, but it's true nonetheless. While selecting fabric for my new apartment, I had really one, no two, requirements. 1. I had to get creative with my spending and stay within a small budget, and 2. I had to be true to myself. I wanted more than anything for my home to be a reflection of me without regard to what's trending on design blogs. I wanted it to be a space that, although small and inexpensive, I could add proudly to my portfolio to give a little more dimension to my design aesthetic. This meant including a garden-y floral fabric as one of my main points of interest in the room. 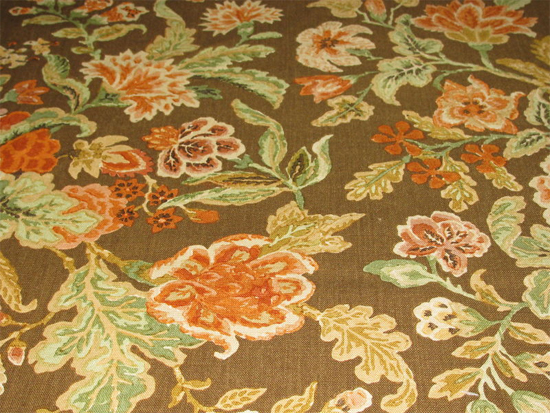 My selection was Lee Jofa's Bardstock in color Mocha (see above). It's pricey, retailing at $390 per yard. I get a designer discount, but even still...it has a hefty price tag. Unfortunately once I laid eyes on it I couldn't envision using anything else. 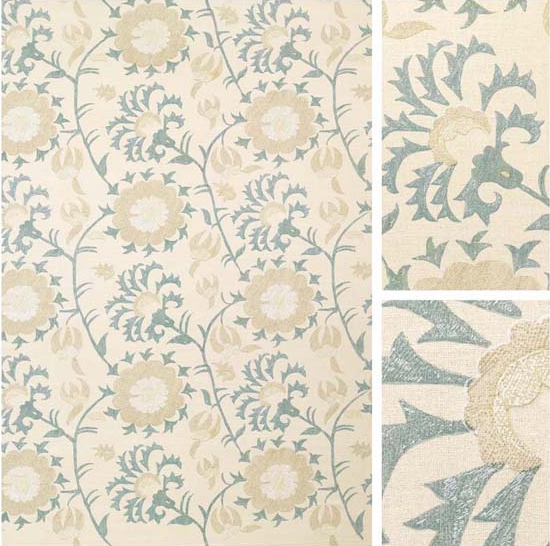 So, going back to rule #1, "getting creative with spending", the budget didn't allow for me to upholster a large piece of furniture or drapery in my beloved floral, so instead I will be ordering the minimum order requirement of 2 yards and creating a throw for my gray sofa. Nathan Turner beautifully illustrates this concept below. My new apartment is starting to feel like home as I fill it up with some of my favorite vintage pieces that have had reupholstered. 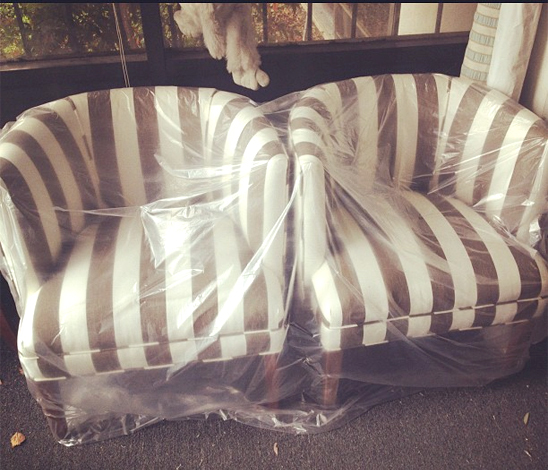 Last week I brought home these fantastic tub chairs (see below) from the upholstery shop and they have really spiced things up. Every room needs a good stripe, afterall. You can stay up to date with my apartment decorating and my other client projects via Twitter and Instagram! 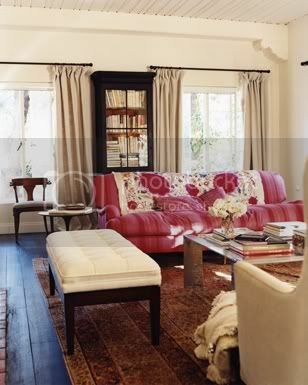 I love the idea of creating a throw with that fabric and I really love those chairs too. I recently had a client who also told me "no florals" but I presented her with what I termed a "handsome botanical" and she really loved it. It was a Duralee fabric with a black background - I think that helped. Looking forward to following more of your projects - and I love Twitter too so I'll be following along there as well.